Do you have a nice scope mounted to a “safe queen” rifle that never gets used? Or maybe you have a set of premium binoculars you bought for that Alaskan hunting trip you never got to take? 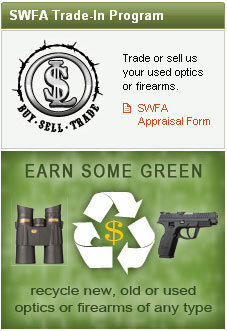 Now you can convert those valuable optics into cash with the SWFA Trade-In Program. You can either sell your gear outright to SWFA, or trade your items in on new products. Just fill out an online appraisal form, upload a photo, and SWFA will evaluate your submitted product. You can designate whether you want to sell your item outright, or trade it in on new gear. Note, you must submit an Online Appraisal Form for all items submitted for trade-in. In addition, SWFA needs a digital JPEG photo of each item, 400 pixels wide and 300 pixels high. Share the post "SWFA Offers Trade-In Program for Optics"